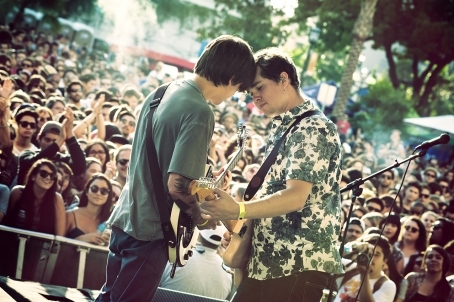 The 8th annual non-profit festival Make Music Pasadena is nearly upon us! On June 6th, over 150 acts in alternative, jazz, folk, electronic, and more will be playing in downtown Pasadena from 11am til 11pm. Over 50,000 attendees are expected for this all-ages event located right outside of restaurants, gastropubs, and boutiques. And best of all: entry is 100% free! Make Music Pasadena will span 20 city blocks in Pasadena, offering five main stages and over 30 supporting venues from IX-Tapa to the Old Town Pub. To help festival attendees cover so much ground, MMP and DoLA have created an interactive schedule to track the performances. Get from stage to stage more quickly with free rides on the Pasadena ARTS buses all day, and listen to the live sets on board. If you've been itching for an outdoors music event without breaking the bank, then this is your chance to see rising Los Angeles notables like bipolar folk act Kera and the Lesbians, South Central synthwave revivalist Autumn in June, psych-pop team Kid Bloom, art rock outfit The Moth & the Flame, and indie funk jam brothers Jr.! Performances will also include renowned acts like Kishi Bashi, How To Dress Well, Hundred Waters, Lydia Ainsworth, Sir Sly, Hidden Charms, Opus Orange, Caroline Smith, and many more to be announced, with a special set by the Pasadena Symphony/The Pasadena POPs in the evening.